Building a business as a side-hustle is a balancing act. You’re spinning multiple plates at the same time. You’re focussing on your creative business one minute whilst also remembering its fancy-dress day tomorrow at your kid’s school, your mum’s birthday next week and oh, you were supposed to make a desert for that dinner you’ve got tonight. A lot of us are jugging our businesses alongside other commitments, whether that be a 9-5, caring for family or anything else. I don’t think we can ever say we don’t have enough variety in what we do, right!? But there are ways to make the challenge of it all easier on yourself. You see, productivity doesn’t need to be about being busy and getting stuff done, it’s about doing less and focussing on the tasks that really matter. With that in mind, here are a few helpful pointers on how you can make the time for your creative side-hustle. There are so many voices out there telling us what we ‘should’ be doing and what will bring us success ‘overnight’. As a result, these tasks and projects find their way onto our to-do lists, even if they don’t really click us or our business. Rather than fighting against the current to do the tasks you’re doing because you feel you ‘should’, your time will be better spent focussing on the tasks you enjoy and the projects that really click with you. So, get honest with yourself and take any actions off your to-do list that don’t click with you or that you think might be there just because you feel you ‘should’ be doing them. It takes a lot of energy for our brains to be changing gear every ten minutes. One of the best ways to save mental energy and make your time a lot more efficient is to batch tasks together. I like to set up theme days to help me with this. For example, I currently work four days a week so I have one working day each week to focus on my business. I spend one Friday a month writing my blog content for the next four weeks, the next Friday taking all of the photographs I need for the following four weeks and the next Friday scheduling my podcast, On The Make, for the next few weeks. For you this will look a bit different depending on your schedule and business. Perhaps it’s one evening a week planning out your social media posts for the week ahead or one day a month spent doing illustrations or developing new product ideas. Perhaps you do a regular market, in which case you could spend one afternoon a month making up and preparing stock. Make a list of your regular tasks and think about how you can batch them together. Block out some time have a theme day or evening and see if it's something you want to make a part of your regular routine. Taking the time to plan out your week in advance can save you a load of time and energy in the week as well as help to keep you focussed on what your priorities are. It’s something that’s often a game changer for my clients and it needn’t take longer than 10 minutes. I find it easiest to do this on a Sunday evening, it’s so heavily embedded in my routine now it’s become second nature. Open up your calendar and see what you’ve got on that week. In your diary or weekly planner block out the time you’ve already got committed to non-business stuff. This might be a 9-5, school runs or those hours in the day that are taken up caring for family. With the blocks of time that are left, schedule in time to work on your side-hustle. Write out a to-do list for the week with no more than three tasks for each day. This should help to give you a realistic to-do list for the week that’s not overwhelming. Last but certainly not least! Making time for you is so, so important but it’s something we all struggle with, isn’t it? It’s only natural when you love what you do but by taking time out to rest and recharge you’ll be giving yourself the time and space necessary to feel inspired and creative as well as avoid the dreaded burnout. What I’ve found works for me is to schedule time in each day to do things like take a walk, read a book or do something creative that’s just for me, and not my business. Knitting is my wind-down craft of choice. You might have something similar that’s creative but also allows you to switch off from anything business related. When you’re planning your week, take a moment to schedule in some windows of time for your self-care. 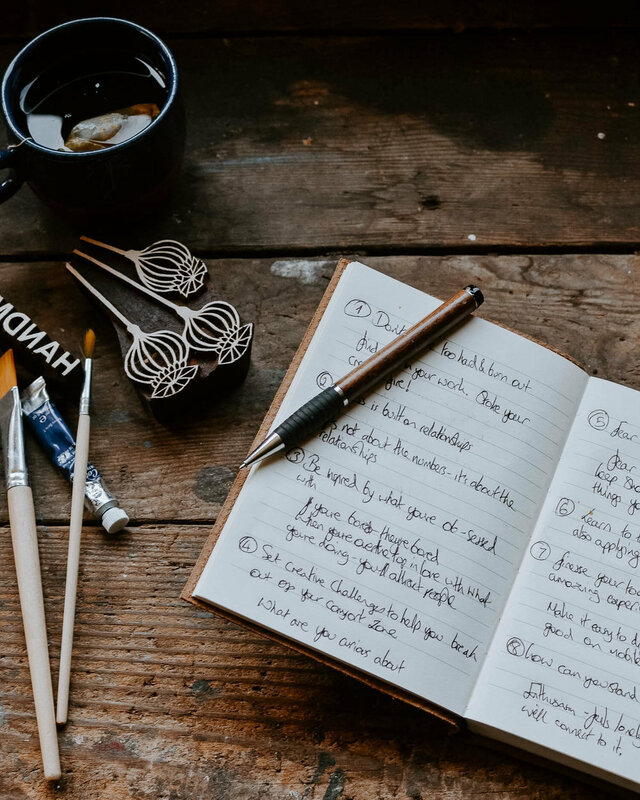 Having time for self-care marked out in your diary gives it a sense of urgency and importance which might just encourage you to make the time for yourself, as well as your business. With all of those plates spinning it’s also important to note that we could also do with giving ourselves a break sometimes, if things take a little longer than you thought they would or if you’ve dropped one of those plates, don’t worry. The most important thing to remember is that your business is all about doing what you love and the best way to stay true to that is to enjoy the business journey rather than always reaching for a destination. Josephine Brooks is a planning and productivity mentor for side-hustlers whose philosophy is all about doing less and focussing on the tasks that really matter, rather than being busy and trying to get lots done. Her mission is to help people who are building a business alongside other commitments to build a creative business that gives them the freedom to do more of what they love and create the lifestyle they long for. She does this by helping them plan more effectively and giving them the tools to boost their productivity, through her course Make a Plan > Make it Happen and 1:1 mentoring.